The story of Mashaa began in 2012, in the middle of a hot and sticky summer in Beirut. It came at the end of a decade. A decade where we had witnessed, all along the coast, new chic beach resorts popping up like mushrooms, with swimming pools and jacuzzis right on the sea, bars and bartenders serving cocktails from inside the pool to the loud beats of techno music. Images Left to right: 1- 2 beach resorts in southern Lebanon- view from top view of pool, 3- beach resort in north lebanon- tabarja, 4- the only accessible public beach left in lebanon, south of lebanon – tyr. In the last few years, things had started to accelerate. Prices started rising insanely. Getting access to the beach can today cost us up to US$40, per person. Just to access the beach! It was about this time when we realised that the beach does not belong to us anymore. We are being forced by developers to pay money to access the beach, even though the Lebanese law – like most countries in the world – clearly states that access to the beach should be free and open to everyone. But this did not stop with beaches. Over tens of millions of meters of lands historically classified as Mashaa’, as well as public properties including a range of State-owned, sea and river properties, were seized over the last few decades. This appropriation happened in the context of constructing a model of rentier economy that would further demote the notion of the public and the public good, and place it at a much lower grade in contrast to private interests. With this, a constructional invasion eradicated green spaces, agricultural lands, beaches, and wiped out popular markets, squares and historical buildings, and replaced the names of places (i.e. al-balad[ii]) that embodied a memory which ought to be preserved. The reclamation project adjacent to the north of Beirut’s downtown area is perhaps the most scandalous annexation of public lands. The Council for Development and Reconstruction, a government institution historically controlled by the late Rafiq Hariri, is spearheading the transfer of close to 300,000 m2 of land from public ownership to Solidere, a real estate development company partially-owned by the Hariri family. The land makes up 35% of the original reclaimed land area, and its estimated worth is over $12 billion – a figure far exceeding the cost of construction, estimated at $475 million. It is undoubtedly the largest transfer of public property to a private firm in the country – without a single dollar changing hands. This wouldn’t be the only annexation of public properties. The Solidere model is a neoliberal model that we find in dozens of projects all over the country’s coast. The scheme is simple: a bunch of powerful businessmen band together; at least one of them is in the government, and he[i] would be in charge of the legal side. He would (re)write the laws (i.e. make exceptions for the sake of the ‘public good’), or get politicians to approve the project in return for political favors, or even shares in the project. While we find this neoliberal model everywhere in the world, what is particular in the reshaping and theft of public space in Lebanon is twofold. First, Lebanon’s banking system runs under bank secrecy (in the same way that tax havens do), which in turn facilitates money laundering. Second, no taxes are paid on land transfer and land acquisitions, even though, in 2012 for example, the declared real estate sales were worth more than $9.2 billion (according to Ministry of Finance figures). We received a lot of answers from people who lived in the same area; some saying it was a wealthy Lebanese who made his fortune in Africa, others answering with the same question. Eventually we found out, with a half-surprise – thanks to an unpublished report about occupants of the seashore done by the Ministry of Infrastructure, that the house belongs to gentleman named Nabih Moustafa Berri – who is no other than the head of the Lebanese parliament since 1992 and founder of the Amal (‘dispossessed’) movement..
Lebanon is blessed with 220 km of coastline. While this should be an asset for all Lebanese and visitors to enjoy, this coastline is now subject to constant violations. We have documented 1,140 encroachments along the beachfront – an average of 5.18 intrusions per kilometer. Only 73 of those encroachments are ‘licensed’ to privatise parts of this coast. The construction and appropriation of public lands in Beirut, and all over Lebanon, provides a lucrative business for those who have power, control or simply just the ‘right’ connections, in order to accumulate massive personal wealth. Some of us, faced with this injustice, grew frustrated, but surrendered by saying ma hayda libnan (‘but this is Lebanon’). Others chose to act on these frustrations, hoping that they can change things. It is in this context that a group of economists, journalists and activists met in August 2012, and started preparing for a big event; a sort of end-of-summer party. The idea was to use it as a launch for the campaign and movement we decided to call Mashaa’ (‘the commons’), and attract a wide range of people, especially young. It wouldn’t be yet another monotonous political meeting under a ceiling fan and neon lights. We would invite designers, illustrators, artists, musicians, and performers, and we would have fun. The idea was that Mashaa’ would be an organization without any particular structure; replicating its name to be a commons in itself, inviting anyone who wants to partake in achieving its goals. Whether by way of agitation through direct-action, or devising new ways to disseminate knowledge through various mediums, ranging from traditional media to online social networks, as well as art and performances. Hence, we worked with artists to collaborate on creative and tactical use of visuals, music, and performance art. Here, we interview Jana Traboulsi and Lara Balaa (maajoun design studio), whom we collaborated with on some of the visuals that were adopted in the format of posters, t-shirts, graffiti, animations, and stickers. Jana: I was asked by a local newspaper, Al-Akhbar, although it never got published. I’ve been doing illustrations for local newspapers, particularly Assafir, since 2005. I remember when I was invited by them, I couldn’t imagine what I could draw or talk about that would be of interest for a newspaper audience. But it was an interesting challenge; I didn’t want to take on the role of a journalist or an artist, instead I wanted to talk about personal stories with a social dimension which people identified with. Image: Left – “because they want to see the sea, we can’t see the sky anymore.” First published in ‘la furie des glandeurs’ n.2, 2011. Right – graffiti adaptation by Mashaa. That’s how I went on a quest looking for how to draw a single picture with a bit of text, that could express a situation or an idea. Most of the subjects I tackle are related to observations I have about the society and the city I live in, so this was the kind of investigation I was leading, which took shape finally in the format of a vignette – a picture with a sentence – that I would publish in the newspaper. I liked the medium itself – the newspaper – because it allows me to reach a wide public in a space where people are not necessarily expecting this kind of visual language. Q: And how did you decide to work on something related to the sea? I approach the sea mostly from the point of view of access to public space, and this drawing perfectly fit what you were talking about in your campaign. The idea actually comes from a personal story: I was living in a building in front of which a gigantic tower popped up one day. I used to see the sea from my window, and suddenly I lost the view. The irony was that on the panels surrounding the construction which advertise what kind of building it will be, they had printed the exact view from my building! So obviously this view was stolen from me and it was used as a main source to promote this kind of highrise building. In a way, it was promoting the luxury of getting an apartment with a view of the sea, and logically the higher you go, the more you have a view of it, while the rest of the common people like us are denied the view. Q: What about the drawing with the crumpled water bottle? Somehow this drawing has an intersection with the one about the sea, but from a different angle. I’ve always had a problem with the idea of having to pay to go to the beach, or having to pay to drink water, and feel these things are supposed to be for everyone. The difference is that here we’re talking more about the issue of public properties becoming privatized. Image: Left – “They make us pay for drinking water and they make us pay for swimming water soon we will have to pay the rain water,“ first published in Assafir, October 2008. Image: Right – “Beirut,” first published in Assafir, January 2006. Q: And besides the sea, what does the city mean to you? Jana: My interest in the subject of Beirut started very spontaneously. The first drawing I published in Assafir was about the city and the war, and I noticed that both on the topical and visual level it was almost natural that I would talk and draw about this city, because it is so present. It is not a space we inhabit only; it is a space that is constantly thought about, criticized, mystified, and it naturally became a recurrent theme for me. This drawing has also a personal story. I spent a few years living in and out of Beirut, and every time I was far away I would feel this longing for it, and that I want to draw it. Whenever I was in Beirut then, I would feel like I was suffocating. And the weird thing is that I drew this illustration while I was away from Beirut – I think it was in 2006 – and I really wanted to draw something about my city. I think I managed to capture the relationship or feeling I have towards it. It was something totally spontaneous I had done in one of my sketchbooks, and only when it got printed and silkscreened for Mashaa’s campaign did I realize how many people actually identified with this representation of Beirut. It was not drawn or thought of as part of a campaign or a comic; on the contrary, it comes from self reflection, and only when people started wearing it or displaying it, did it take this dimension. Q: Now when we go to some people’s houses we find your drawings adapted to a sticker stuck on their fridge, or hung as a poster or postcard on the walls of their living room, or even printed on a t-shirt they’re wearing. What’s your take on the adaptation of your drawings to other formats such as graffiti, stickers, or postcards? Jana: Well this happened mainly thanks to you guys! It’s true that the newspaper was one big audience, but the distribution that you did through Mashaa’s campaign actually reached a different kind of audience as well. What I think is very interesting is that it’s both related to the visual language and to the medium, and what I mean by that is that the drawings are simple and the statements are short and easy to understand. This makes it much easier to distribute; if my technique or visual language was more complex or common, I don’t think that it would have worked to adapt it to a stencil or make it into a sticker. And I find this beautiful! I also think it’s great when one’s work gets appropriated and adapted to other mediums like a sticker, or a graffiti, or a link that can be circulated. Suddenly the work is not important anymore as a piece but as a statement that people can carry. I see it for example on the back of laptops of some people working in coffee shops, and I feel when you open your laptop it makes a statement, or if you hang it on a wall, it’s even stronger – like a discreet sign of resistance. 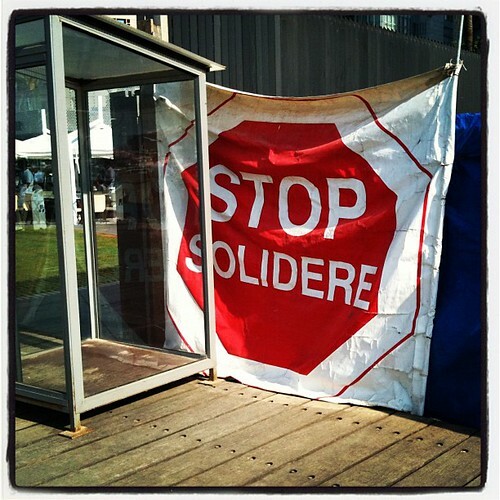 When I used to see someone with the Stop Solidere sticker it would mark me, even if it’s impact is small: just the idea that other people around me abide by this, or make any sign of resistance, would make me feel there is a community apart from me, other people that believe like me that Solidere is this monster eating everything. And that’s why I think it’s very interesting for me – the sticker as a medium, but also stencil. Suddenly you engage with people who think like you, and the whole way of thinking is actually reduced into this one visual, this one sentence. Q: Your drawings have also circulated a lot online. Someone from Alexandria sent us a message saying they would like to use the stencil with the city skyscraper because the same thing is happening in their city. What do you think about your drawings being distributed through social media? Jana: Yes I remember that! I was not aware of this dimension at all, but the web medium definitely allows the work to extend outside the country. And somehow it makes it not important anymore if the drawing represents Beirut or not; it becomes made of these shadows of buildings that eat from the sea, and this happens in so many other places. I can speak less of the whole internet thing, but it was really cool for me because I’m not on Facebook. I have no idea how many ‘likes’ is a lot or how many shares is a lot, but I heard from a lot people that they saw my visuals, and that it was widely circulated. Lara Balaa, co-founder of maajoun communication and type design studio. Q: How did you come up with the message behind your poster? Lara: In our first meeting, while you introduced the Mashaa’ project, you brought up several number based facts that sounded quite shocking to me. So I got interested in transmitting these facts, particularly because they were unknown to most people — despite them being published in local newspapers. One fact that I couldn’t get past was that 1 m2 of the Marina was being rented out (by the government) to Solidere for 2,500 LBP per year; which is equivalent to no more than 2 USD! When I went back to the office that day, I shared this piece of information with my work partner Khajag, and we couldn’t help but joke about it; can you imagine? 2,500 LBP is the price of a man’ousheh! This is where the idea came from. Q: There is now a hype for infographics. Activists and publications are trying to make use of this medium. But sometimes they are complicated and hard to ‘read’, which goes against their very purpose. We think that part of the success of this campaign lies in its simplicity. How did you find the concept for your poster? Lara: Inforgraphics work best for simplifying complex information. This campaign was based on relaying a single but shocking fact (a symbolic anecdote), and in that sense, you are definitely right. Focusing on one key message is much more accessible, focused, and quick in terms of communication. We had a lot of fun shaping this up, and it was somewhat of an interactive process, which led to a whole campaign rather than a simple poster. We tweeted the question ‘what can you buy for 2,500 LBP?’ and got funny answers such as ‘a pack of cigarettes’, ‘man’oucheh and Bonjus’, ‘a condom’, etc. Then I asked my parents, and they answered ‘a kilo of grapes’. Each person came up with an answer that reflected his or her own lifestyle. And we collected these answers in a poster that highlighted the absurdity of the situation. Q: This idea was then adapted into a series of postcards and a little animation. Why did you use different media? Lara: We started with the poster. Then thought it would be fun to expand into a set of postcards highlighting the parallel between the price of the 1 m2 in the Marina and the other items that could be purchased for the same amount of money. As for the animation, it was mostly the idea of the mashaa’ team who proposed projecting a slideshow of the postcards during the event, so we developed these into a small video animation that later went viral on social media. Q: During the event, you also created an interactive wall where people could draw the item that they would buy for 2,500 LBP. How did that go? Lara: The idea we worked with was versatile, and interactive since the beginning. So the wall intervention was a natural extension of the work. People were hesitant to interact at first, but as soon as we had a few volunteers, others were waiting in line. The event hosted all types of people, and each had their own thought on what the amount was worth. The owner of the Saint Georges for example was selling ‘Stop Solidere’ postcards for 250 LBP, so he stuck a postcard and wrote ‘x10’ beside it. At some point we left the wall and went inside to enjoy the live music. By the time we came back, not only all allocated spots had been filled, but people had also added an extra row of drawings. This meant they really enjoyed the interaction. When working with a social topic, it is always good to engage others in the process. This allows them to participate in the shaping of the message and take ownership of the cause as a whole. They are almost exclusively men. Al-Balad, which literally means ‘the country’ is a historic and common reference to the city-center. The old downtown in Beirut is now widely referred to as ‘downtown’ or Solidere.